“The Little Flower” is an educational, inspirational and at times comedic one-man show set in the office of Fiorello H. La Guardia, during his last day as three-term Mayor of New York City in 1945. The show stars Tony Lo Bianco. “The Little Flower” presents a historic look into the life and career of Mayor Fiorello H. La Guardia - a courageous and flamboyant personality, who read comics to the children during a newspaper strike, fought against corruption and cleaned up city politics setting a new standard for mayors and politicians in America. He was a great statesman and champion of the poor and under privileged, and a father figure to millions of Americans living through the hard times of the 1930’s and 1940’s. La Guardia was a man of integrity with outstanding principles, morals and values whose voice resonated throughout America. He was steadfast in standing up for his beliefs regardless of obstacles, challenges or political agenda. The show is set in “present time-1945” and “flashbacks.” Chronologically, it re-enacts important events in La Guardia’s life and the lessons he learned. It moves colorfully through the first half of the 20th century in America, and provides a clear vision of a man who not only lived through those times, but helped shape them. The problems La Guardia faced parallel those we are facing now. He held strong convictions on family values, inflation, women’s suffrage, financial responsibility, education, unions, political corruption and prohibition. He transcended political party barriers while holding strong to his plan of action that served him well then and could serve the American people today! This adaptation is enlightening and inspirational. His legacy will live on forever! 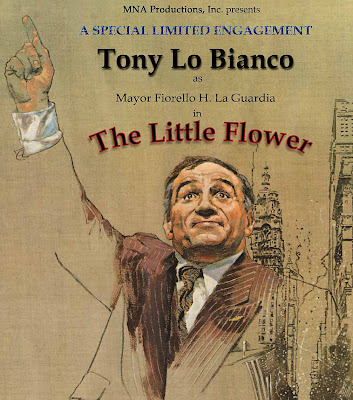 "The Little Flower" about Mayor Fiorello H. La Guardia is performing at the Dicapo Theater on E. 76th St. between 3rd Ave and Lexington Ave from October 23rd through November 2nd. You can get tickets HERE. Philanthropist Jean Shafiroff will be honored tomorrow March 30, 2019 by Al Sharpton's National Action Network - Women's Auxiliary at a luncheon tomorrow at Astoria World Manor. Other honorees at the great event will be Nina Saxon, Jason Parker, Nida Khan, Honorable Machelle Sweeting, Julia Nunez, Korey Wise, Dr. Cynthia Ashley, Vera Fields and Vanessa Newby-Jeffries. The event will be hosted by Audrey Smaltz. Donation is $80.00 which includes a open bar and a buffet. Music will be by DJ Wayne Glover. You can get your tickets by calling 877-626-4651. Tadashi Shoji, a leading designer of elegant dresses, along with bridal, accessories, shapewear, intimates, kids fashion and fragrance will again partner with the Samuel Waxman Cancer Research Foundation (SWCRF) in support of World Cancer Day on February 4, 2019. This marks the 5TH year of Tadashi Shoji’s participation in the SWCRF Pay It Forward fundraising campaign. To help raise funds for such a worthy cause, Tadashi Shoji has created an exclusive credit card holder in support of SWCRF. This credit card holder’s purple exterior pays tribute to the World Cancer Day’s universally recognized color palette. Robert and Francesca Agostinelli welcome their second baby girl, the beautiful 7.1 pound Altea. She becomes the younger sister of Angelica Agostinelli, born two years ago. Robert Agostinelli is an Italian American self made billionaire and financier who is the Chairman and Co-Founder of the successful private equity firm Rhône Group. Additionally, Robert is a member of the Council on Foreign Relations, a former Vice-Chairman of the Council for the United States and Italy, a director and advisor to many US and European philanthropic and civic institutions… and a friend of such world leaders as former French President Nicolas Sarkozy and former Spanish Prime Minister José María Aznar. He's also a senior member of the Marine Corps Scholarship Foundation and chairs the annual National Memorial Day Parade in Washington DC. Sighting January 2019 - Celebrity philanthropist Jean Shafiroff spotted in CanCun. Celebrity philanthropist Jean Shafiroff was spotted walking on the beach in CanCun. It is rumored that she was there with a group of graduates from the John F. Kennedy School of Government Studies at Harvard University. Included in the group were friends Ana and Scott Stone and former Mexican President Felipe Calderon. Celebrating a mutual commitment towards compassion for all, Global Strays the international animal rescue charity co-founded by Elizabeth Shafiroff, partnered with Ted Barkhorn, contemporary fine art photographer, to launch his first New York exhibition at NOVO LOCALE (263 Bowery). A portion of the proceeds from the sale of work by Ted Barkhorn whose modern imagery reveals the natural world, will go to Global Strays for the duration of the New York show and through Earth Day April 22, 2019, on tedbarkhorn.com. Upper East Side hotspot T-Bar Steak & Lounge, which has been warmly embraced by New Yorkers since it first opened its doors in 2007, is noted for its perfect execution of classic dishes. The restaurant’s Executive Chef Ben Zwicker, previously of the Four Seasons, Aureole and Petrossian, makes T-Bar’s classic steakhouse fare relevant and exciting, while also putting his unique twist onto other classic dishes. Jean Shafiroff, prominent philanthropist and author of Successful Philanthropy: How to Make a Life by What You Give, hosted a reception at Alice + Olivia Palm Beach in Royal Poinciana Plaza, Palm Beach Florida. 20% of the sales benefited the Tri-County Animal Rescue Shelter. Jean Shafiroff adorned jewelry by Sequin donated for the event. Sequin Jewelry participated and gave 20% of their profits to the Shelter as well. Attendees included: Jean Shafiroff, co-founder of Tri-County Animal Rescue Suzi Goldsmith, Christine Schott, Felicia Taylor, Bonnie Pfeifer Evans, Amy Hoadle, Rashmee Sharma, Jane Stillman, Pamela O'Connor, Jeannie Lawrence, Matt Rich, and Evan and Karyn Turk. NEW MUST SEE THRILLER 'THE SAMARITANS' NEXT PARANORMAL ACTIVITY? TIMES SQUARE GOSSIP EXCLUSIVE: The Samaritans is a new thriller from Viva Pictures being released on digital and on demand April 16 2019 and that date can’t come soon enough. It is a rare movie where the “making of” story is as intriguing as its polished finished product. It is not hyperbole to put The Samaritans on the same list as other micro-budget success stories, Blair Witch Project and Paranormal Activity, two other independent horror/thrillers that transcended their limitations while leaving an indelible mark on the genre. Canadian Hip-Hop Duo, 88Glam announced the dates for their whirlwind 2019 Canadian concert tour featuring twelve performances in an eighteen-day period this January 2019. Founders Derek Wise and 88 Camino debuted the name in November 2017 when they premiered their first music video “12” featuring a cameo from The Weeknd and the first track on their April 2018 album, 88Glam Reloaded. Their Second album, 88Glam2 released in November 2018 by XO Records and Republic Records includes collaboration with Gunna (Track #10 “Racks”) and Nav (Track 6 “It’s a Flex”). Both albums are available on iTunes. Media Punch Inc. Has All The A-List Photographers Ready To Shoot Any Press Event. Join us to keep our park and neighborhood safe.